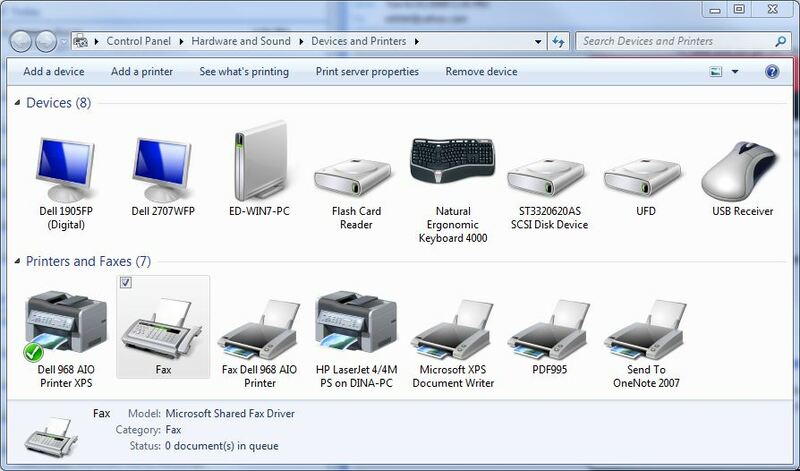 One of the nice new additions to the Windows 7 environment is an interfac entry entitled “Devices and Printers” that shows up in the bottom section of the right-hand start menu along with Control Panel, Default Programs, and Help and Support. Here’s what this currently looks like on my production machine. You’d think that discovery of printers on a network with Windows 7 machines is simple and straightforward, wouldn’t you? If you have turned on File and Print access, you’d expect that UNC names for the printer of the form \\PC-name\Printer-name would work like a charm to gain access in the Add a Printer wizard. Not so — at least, in my experience. Even making sure that both sides of the connection (would-be printer user, and would-be print provider) had File and Print access enabled, and belonged to the same workgroup didn’t do the trick in all cases (it did for two out of three machines, but not for all three). The “trick” — if there is one — turned out to be setting up a Windows 7 Homegroup and making sure all machines that wanted to use the printer, as well as the machine that hosted the printer, belonged to that Homegroup. My earlier understanding of Homegroup membership was that it added to existing Windows capabilities, so that if you didn’t take this step, you could still revert to old-fashioned UNC names to obtain device access at the NetBIOS level. I’m not sure if this is just an idiosyncracy for one of my machines, or a general tendency for Windows 7, but I couldn’t get everything to work properly on my network until all my machines had joined the same workgroup. After that, proferring or obtaining printer access across the network was a snap. I can’t help but guess that this won’t affect AD environments, but if you run into strange printing problems there with Windows 7, drop me a line and let’s figure out what’s going on there, too. Could be interesting!